Return to California — PJKoenig Golf Photography PJKoenig Golf Photography - Golf Photos For Those Who Love The Game. After all of the “new” states had been explored, it was time to head back to where the journey started. It was time to return to California and head up the coast towards the finish line. Up first was a visit to Palm Springs for a Christmas celebration with my parents. As many of you know, my parent’s house burned down during the Camp Fire in Northern California. The good news is that they are safe and they have an undeniable persistence in the face of tragedy. This is the second time that their house has burned down. I wasn’t alive for the original tragedy, but it was great to see them in Palm Springs after the second one. Since The RGV Tour does not give any of it’s employees holiday vacation, we were forced to work right through Christmas. Nobody really complained though and most employees were very happy to have the extra work. When The Hideaway is your office, nobody minds. Even Santa had some time to get in on the action. After the holiday festivities, came one of my favorite days on the RGV Tour. 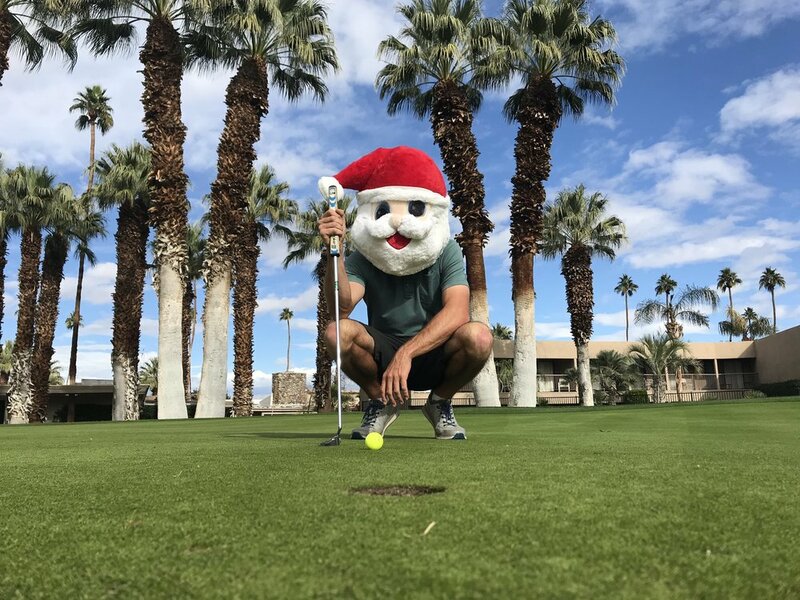 It was a day of 54 holes in late December at PGA West. When we started out the day, 36 was on the ambitious side. Only the golf gods could have known that we would finish up #54 in total darkness. One of the most unique animal experiences would also occur at PGA West. On the back nine of the Palmer Private course, a group of 30 Big Horn Sheep spilled down the mountain side and out onto the 15th green. It was an incredibly cool experience to get up close to such spectacular animals. I thought I was going to get charged a couple of times but it turns out they were just trying to speed up play. 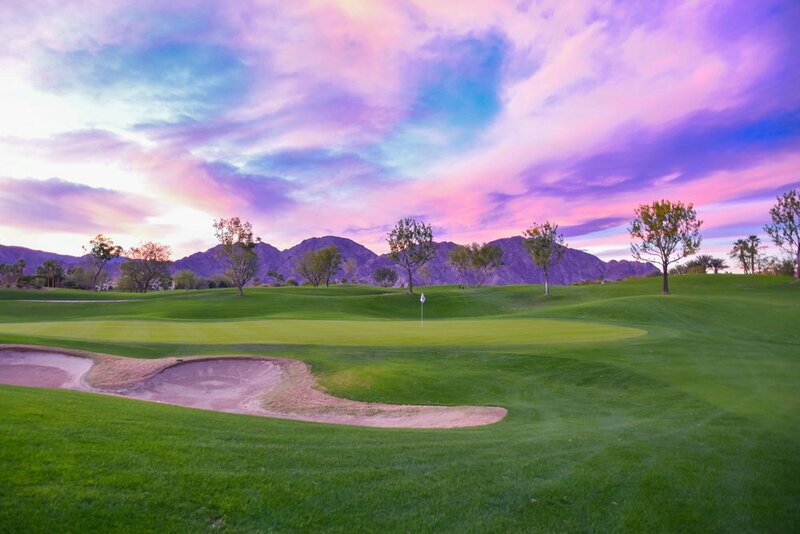 The resort at PGA West has 6 different golf courses, 3 private and 3 public options. 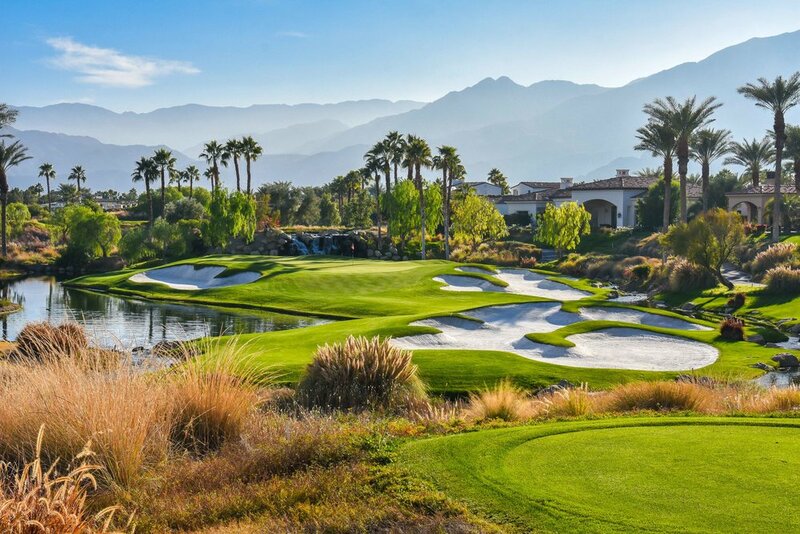 The Stadium Course is public and the most well known of the bunch as it plays host to the PGA Tour’s Desert Classic. The other 2 public options are the Norman and the Nicklaus Tournament Course. For the RGV Tour’s 54, we took on the Weiskopf Private, The Palmer Private, and the Nicklaus Private Courses. Next up on The RGV Tour agenda was a visit to Los Angeles and a meeting up with RGV Tour veterans Ben and Evan. I scooped up my co-pilots at Rancho Park and we got things rolling with some municipal golf and some In N Out Burger. My sights had been set on Sherwood Country Club for quite some time and we finally had a tee time on the books. This was going to be good. The story at Sherwood starts on the 7th hole after my tee shot had come to rest on the par 3 6th hole. As Ben was hitting his tee shot after mine, my ball began to move. It was coming back down the slope and heading right towards the hole. This was it! The ace was going to happen in dramatic and unusual fashion. False. It was going to burn the edge and come to rest within a foot. Whatever. The scene of the crime on the 6th hole. My favorite hole on the property was the par 3 8th hole. Next up was a day of 27 holes that started at Terranea Golf Links and ended up going down in golf history. On the 7th hole of the par 3 course, Evan Johnsen entered the RGV Tour record book with the very first hole in one on the RGV tour. We did not see the ball go in the hole from the tee box, but when we looked into the cup and realized we had an ace on our hands, we partied like it was 1999 and the ball had just dropped on the year 2000. After nearly 5,000 attempts by RGV Tour players, someone had finally found the bottom of the cup on a par 3. The even better news is that it was our good friend Evan Johnsen, Program Director at The First Tee of Greater Seattle. Evan spends his days with kids and helps them to make better decisions in life and golf. We have ourselves a serious case of golf karma. Congratulations Evan! Side note: Ben would make a par 3 on the hole, and I would roll in a short birdie putt. That is a 1,2,3 on the scorecard. The party was still going when we reached the 8th tee box. Evan teed one up and pounded it 60 yards right and into the swamp. “Was that your ace ball?” I questioned. “Oh crap,” Evan responded. I quickly exclaimed, “That thing is worth $12 million, we gotta find that ball.” Fortunately, eagle eye Ben was in our group and somehow found the dang thing under 7 layers of grass, brush, and crab grass. No word yet on when Evan is gonna put that thing on E-Bay and cash in. Evan Johnsen with the very first Hole in One on the RGV Tour. The Links at Terranea is one of the best 9 hole courses in the USA. For the afternoon round, we took in the scenes of Rancho Palos Verdes for a walk on the 1924 George C Thomas and William Bell design. This duo is also responsible for clubs like Riviera CC, Bel Air CC, Los Angeles CC North and the course at Ojai Valley Inn. After creating golf history in the morning it was appropriate that we walked on some golf history that afternoon. The downhill 4th hole at Palos Verdes Golf Club. Evan contemplates life after his hole in one. What else is there left to accomplish? There are lots of great views and elevation changes at Hidden Valley. That afternoon, the RGV Tour headed out to Oak Quarry in Riverside for the final round of 2018. The wind was furious on the final golfing day of the year. After Ben Garrett drove his tee ball 405 yards on the 2nd hole, we had another RGV Tour record on our hands. Now Ben can hit it far, but 405 yards is ridiculous. 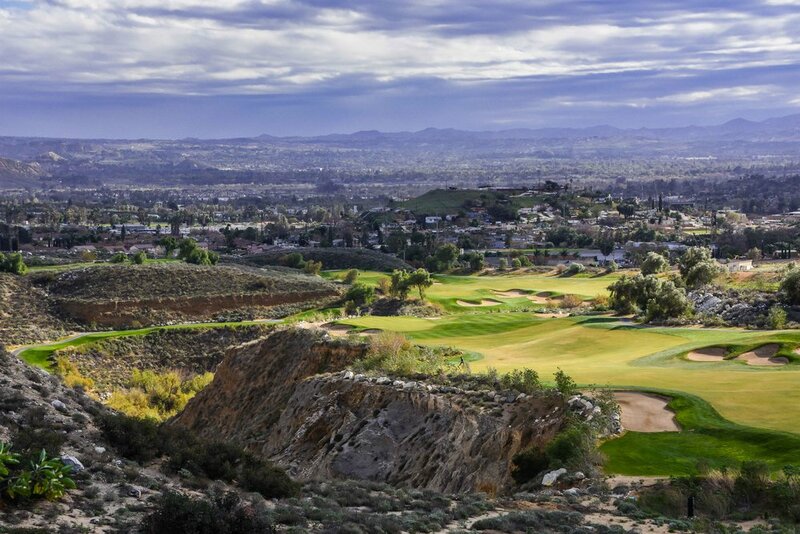 The golf course at Oak Quarry also features several of the most outstanding and unique golf holes in the Los Angeles area. The action really picks up on the short par 4, 4th hole and plays around the quarry on holes 5 and 6. 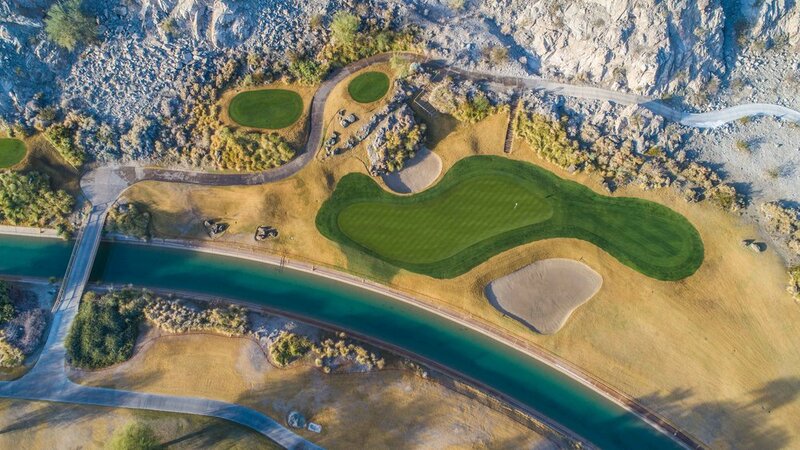 Your golf senses will then go into overdrive on Oak Quarry’s signature 14th hole. 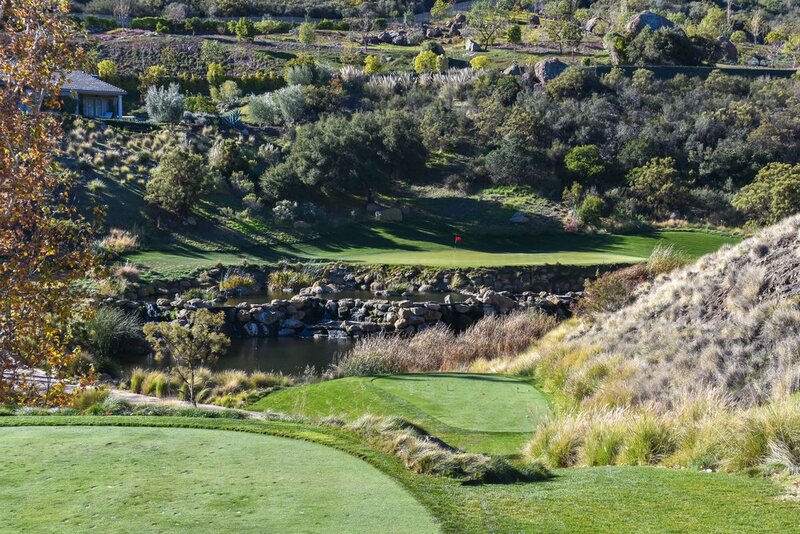 It’s a par 3 that plays down into the heart of the quarry providing one of the most stunning golf views in Southern California. As for the final hole of 2018, I ran a Twitter poll to check the pulse of fan confidence. It turns out that 31% of you believed that I was going to make a “smooth 7” to cap off the golf year. The good news: I ended up with a nice little par. and made it into bed before 11pm. The par 4 6th hole at Oak Quarry. The short 4th at Oak Quarry is drivable when it plays downwind. The next morning we headed out to Mountain Meadows to get our golf and Phat Scoot on. For those not aware, the RGV has been outfitted with a state of the art Phat Scooter on the rear of the vehicle. The idea is simple, it is a scooter for the golf course. These scoots can get up to 20 mph and have different settings dependent on the terrain. Here we see Evan Johnsen in the “Cool AF” setting. After the round, we headed out to the Rose Bowl for some football action. It was the Washington Huskies vs the Ohio State Buckeyes and most of the game was a snooze until the Huskies made a run in the fourth quarter only to come up short in the end. We had nabbed some premium RV parking at the Rose Bowl and decided to stay overnight at our sweet parking accommodations. That evening we played a pretty intense game of poker with those golf ball marker poker chip things. In between hands, it was fun to discuss the different courses on the poker chips that had been visited on the tour. Rose Bowl selfie time with Ben and Evan. Koenig was the big winner in the Rose Bowl poker showdown. The next day, the tour paid a visit to Los Angeles Country Club. There are no pictures allowed at LACC, so you are just gonna have to wait until 2023 when the US Open visits. LACC has two courses and is easily in the running for best 36 hole club in the country. The good news is that they do allow photos at Wilshire Country Club down the road. With an excellent restoration from Kyle Phillips in 2010, Wilshire’s golf holes focus on angles of play with an emphasis on the ground game. In 2018, the LPGA has recently rewarded the club’s efforts with a 3 year deal with the HUGEL-JTBC Open. The RGV Tour rewarded Wilshire as well with a visit in early January of 2019. 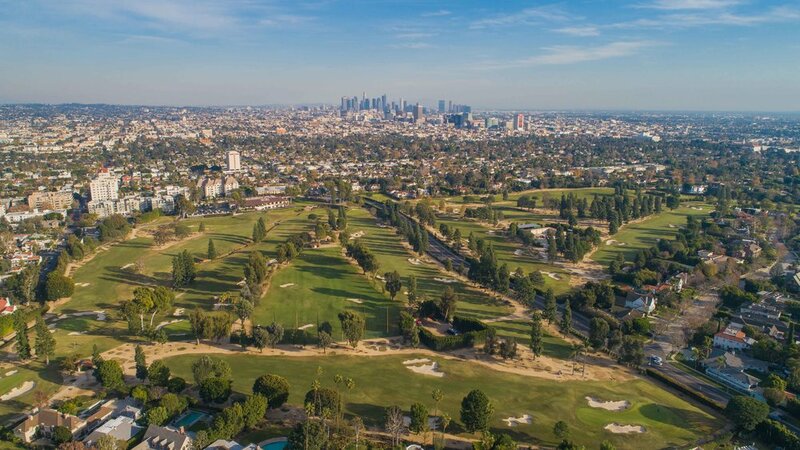 The Hollywood sign is visible from Wilshire’s 9th hole. Mmmm good bunkering at Wilshire. With a flight out of town looming for Ben & Evan, we had time for one final tour stop at Rolling Hills Country Club. The club was formed in 1965, but for those familiar with the original design, you wouldn’t recognize the course today. David McLay Kidd has completely revisioned the golf course. Kidd and his team moved 6 million cubic yards of dirt to completely reshape the design. In football terms, that is 6 Rosebowls full of dirt. The results are excellent and you would never guess that such a herculean earth moving effort had taken place. Before heading to the airport, our trio sat down to record a hot fire podcast about Evan’s historic ace and our wanderings around the LA golf scene. The fine folks over at Callaway Golf launched an entire new line of products in January of 2019. The new ERC golf ball, new Apex irons, and the new Epic Flash Driver were all on display for us to try out during the launch event. I launched a couple of Apex irons early and fell in love immediately. On the far left you can see Mr holein1trickshots himself ogling my tour quality trajectory. Phil Mickelson receives the star treatment from Michelle Wie, Kira Kazantsev, Amanda Balionis and Ashley Mayo. The Callaway launch event was packed with influencer and celebrity types. Kira was Ms America in 2015. Ashley Mayo is the reigning Mrs Golf America, Balionis is campaigning for Ms America in 2019 and Michelle Wie has won the US Open. There was even a Colton Underwood siting. After spending a year on the road and away from televisions, people had to inform me that he was ABC’s current “Bachelor.” Bob Menery was also there getting zoinked. The event was capped off with a team game to see who could drive more golfballs into each other’s faces. It was Callaway’s AJ Voelpel and his homies VS Hashtag Chad and his army. In a twist of fate, AJ drove two balls through his own face, cementing the victory for Chad. AJ’s self inflicted eyebrow piercing was the shot that sealed it. Michelle Wie and Chris Harrison sit down to discuss internet dating amongst other things. BONUS BONUS Blog action: Rustic Canyon with Erik Anders Lang and Torrey Pines with Tisha Alyn. I had heard rumors about a mysterious man in LA known as Erik Landers Lang. They had told me that he was a film maker and a golf nut. There were even whispers that he was referred to as the coolest man in golf. Then they told me that he had a dog named Snowball. I immediately booked a tee time and a podcast with Snowball. Since the RGV Tour played Torrey Pines’ South course on the outward journey, we needed to hit the North course before we skipped out of Southern California. You know, to round things out. Joining us for the adventure was Tisha Alyn. We teed off way too late to get the round in and as we made the turn the sun began to set. That’s when all of the other golfers called it quits. Tisha and I did not give up. Tish made four birdies in a row and I chipped in on the 18th hole for a stunning finish in the darkness. Get the full scoop on episode 33 of the podcast. The sun sets on Torrey Pines and the RGV Tour’s time in Southern California.